This item was requested and although it is not colorful like the requested work, I hope it is just as good. There are 11 files in this group, each one, except for the blank, has a number spelled on a background of handwriting rule. The numerals are one through ten. 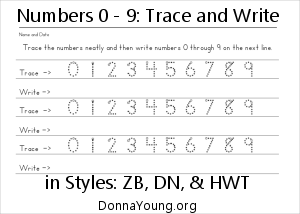 Printable handwriting practice file with 2 identical lessons for numbers 0 through 9. Each lesson has six lines of handwriting practice in which the student traces the numbers on a line and then writes the numbers without tracing on the next line. I decided yesterday to make some handwriting strips while looking at a penmanship sample that I had cut out to evaluate some other handwriting thing. 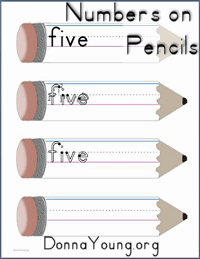 Read about these and see which handwriting styles are available at the page linked. See you later, alligator.